Apricots are a gamble. They look to me to be a tiny, tasty smaller cousin of a peach. When I saw them in the farmer's market on Saturday, I assumed they would be as sweet as the fruit they were sharing the table with, cherries and plums. 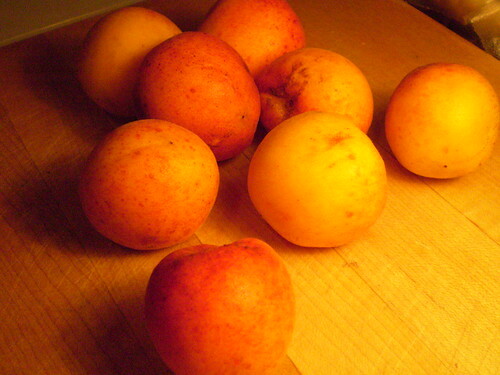 But, as Nigel Slater wrote about apricots in The Kitchen Diaries, "their eating quality depends more on luck than good judgement." Although this statement made me feel a bit better about my purchase, I still had a basket of gorgeous, but very tart, fruit on my hands. Personally, in the summer when fruit is as juicy as it is right now, I hesitate to bake it into anything. Sweet fruit is a dessert all on its own. Sunday night was a different story. I wasn't going to let my apricots go to waste. I took Nigel's advice and decided to "tease out their flavor with warmth" (why paraphrase when he says it better than I could?). I decided to go with a classic French dessert, the clafouti. Clafoutis are traditionally made with cherries, but many different types of fruit would work well. For instance, Julia Child gives different variations using plums, pears or blackberries (although she didn't mention apricots, maybe it is not traditional). I took my recipe from the San Francisco Chronicle cookbook (my favorite favorite cookbook of all time). It is essentially a pancake-type of batter poured over fruit. Some variations (I checked quite a few) use more cream than others and some seem more custard-y than others. Regardless, this was my first clafouti, so I guess I have plenty of room to try others. It did remind me of a Dutch-pancake, something I used to make for brunch sometimes, which is also a batter poured over fruit that puffs up as it bakes, and deflates quickly as it cools. 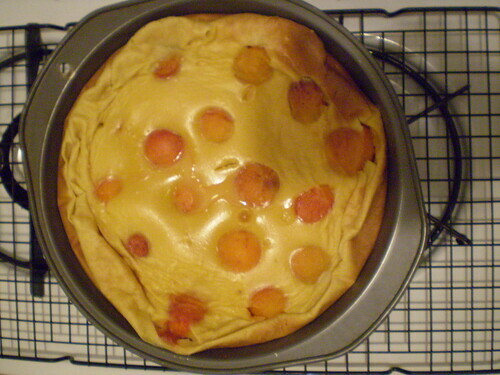 I think in the end my clafouti was satisfying, although the apricots were still quite tart even after baking. The batter was lighter than a cake, but more egg-y tasting than a pancake. If I replicated this dish, I think the apricots could benefit from marinating in some kirsh and sugar, a Julia Child suggestion from Mastering the Art of French Cooking. I'll admit I probably should have had another basket of apricots to place in the cake to sufficiently cover the pan. But, then again, sometimes home cooking is about making due with what you have, and I only had one basket of apricots. Looking at the positives - I liked that it wasn't as heavy as a cobbler would have been, had I done that instead. I even think the leftovers could make an acceptable breakfast, and what's better than dessert for breakfast? Adapted from a recipe by Georgeanne Brennan in The San Francisco Chronicle Cookbook. I noted where I substituted ingredients, but if I set out to bake this again, it would be preferable to have the full-fat dairy ingredients. Preheat the oven to 350 degrees Fahrenheit. Butter a deep baking dish. Combine all the ingredients, except for the apricots in a mixing bowl and beat with an electric mixer until frothy. (Alternatively, mix all the ingredients in a blender if you prefer). 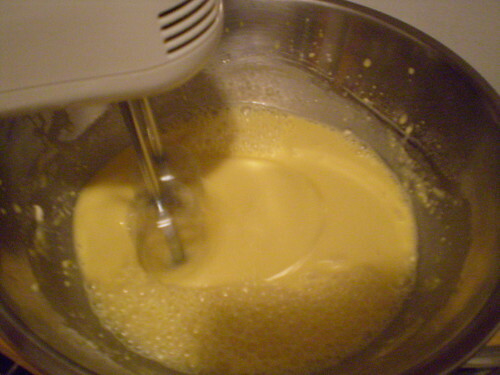 Pour just enough batter into the pan to cover the bottom with a layer about 1/4 inch deep. Put the pan into the oven for 2-5 minutes, or until just set. 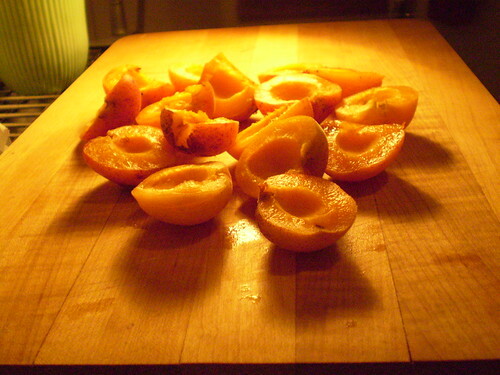 Remove pan from the oven and arrange apricots face down evenly around the pan. 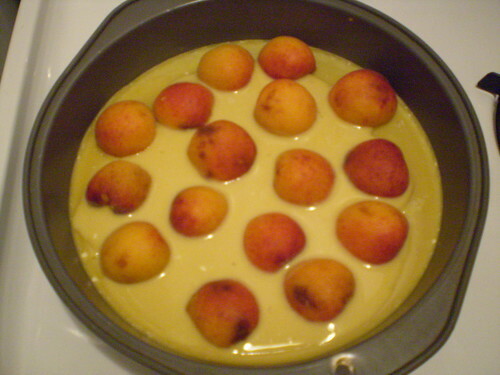 Pour the remaining batter over the apricots. Bake until puffed and brown, about 30-35 minutes. It is done if a knife inserted in the center comes out clean. Serve warm and sprinkle with powdered sugar.